There's been a lot of hype about Meyer lately with Breaking Dawn coming out to internationally abysmal reviews. I haven't read the series myself, but she bought this book to "see what the fuss was all about." 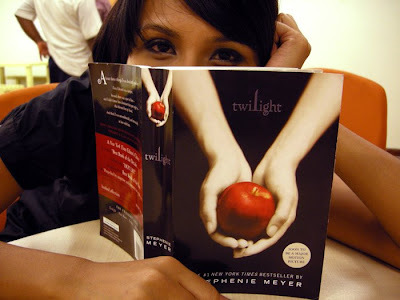 She is currently at page 432, and says the book is "okay lah" and she can see why teenagers love it. She describes the book as "fluffy, and the writer takes this much of the book to build up the plot,"
She just started on it yesterday and says she's the type who likes to read three books at one time. PS: tagging along with a classmate tomorrow while he runs his errands in KL. I'll be on the train. Bring your book! Hello! I've come to visit from People Reading in San Frnasico, a favorite blog of mine to read. I will also bookmark yours. How incredible that I get to see what people are reading in another country. welcome to the book blogging family! im excited to read this blog and will bookmark and link to you. It is fluffy reading - but a good read for the summer. I laughed so hard, when I saw the "okay, lah" quote. One of my dearest friends is Malaysian - and we make jokes about how she adds "lah" to every sentence, and how I (being filipino) add "aaah"
"How late it is, how late." Now where did that come from? anyway, notice how only women and children read for entertainment? how strange that is, how strange.